The special celebration to mark the contribution of the late Baroness Rachael Heyhoe Flint to the lives of hundreds of local children with mobility problems through the annual collection on Saturday 22 April 2017 was a tremendously happy occasion. The scores of collectors from the Tettenhall Rotary Club and POWER PLEAS reported a very positive response from the fans and the brilliant weather helped. The day started brilliantly with an anonymous donation of £100 at 7am and continued when our second Wolves wheelchair recipient Karl Emery, who is a member of the Presidents Club, met up with Jacqui Oatley and Rotary Club stalwarts Eric Johnson, Alan Russell and Wasil Buczkowski. There followed a half time lap of honour to the applause of an appreciative crowd, in which Rotary Club President John Margetts joined with Eric Johnson to lead the following recipients spanning the years from 1995 of Rachael’s Wolves Wheelchair initiative: Karl Emery and Rebecca Raymond Barker, second and third Wolves wheelchair recipients, Sean Crowe, Luke Milligan, Jack Smith and Ben Stack, powered wheelchair footballers, and Mike Porter, Wolverhampton wheelchair basketball player – the rest of the team were retaining the Junior National Championship at Nottingham thanks to the ten wheelchairs presented a year previously with funding from the Fiona and Geoff Squire Foundation and POWER PLEAS, secured by Rachael. Scarlett Baker and James Padfield in their life changing Trikes tailed off the appreciative Rachael recipients and the group finished with Keith Berry and Dave Parry, founder members of POWER PLEAS thirty years ago. The first Rachael’s Day and the 30th year celebration resulted in a sum collected of £2375.15. This will be added to by an anonymous donation of £100.00 and gift aid to be claimed of £618.79 making a grand total of £3093.94. With the money POWER PLEAS received earlier in the week from a Coop 1% scheme we will be able to buy a STRIKEFORCE Powered Football Wheelchair for the Telford Powerchair Football Club. 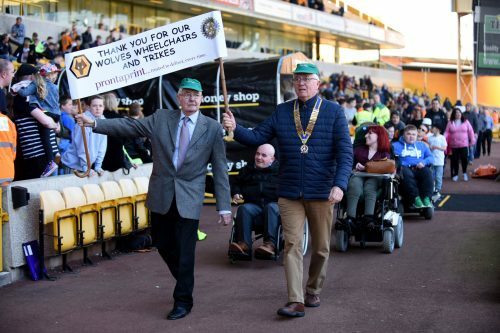 The Rotary Club and POWER PLEAS are very grateful for the continuing support of the Wolves Community Trust and Wolverhampton Wanderers Football Club in helping to achieve freedom, fun and force power for their most appreciative recipients since 1995. Now for the other three STRIKEFORCE chairs needed by the team. Donations can be made online here or by contacting the Wolves Community Trust.